It’s incredible to think now that there are people old enough to legally play online slot machines who may never have inserted a real coin into a real, physical slot machine. The internet in the form we recognise it has now been around for more than twenty years and the ability to use real money in virtual slots has been with us since the mid-1990s but the original slot machines goes back way before either of those dates. The original slot machine is an American invention which can be traced back to the end of the 19th century when a Californian named Charles Fey designed a machine with three different reels and five different symbols based on an earlier, more complex design which featured poker cards. 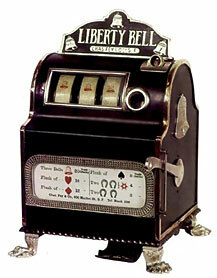 The new design was simpler and allowed Fey to use a more efficient payment mechanism; the conclusion was a mechanical slot called the Liberty bell which became a commercial success. There is some argument as to whether Fey conceived the machine in 1887 or 1895. Fey had the burgeoning market to himself for more than a decade and struggled to keep up with demand even when gambling was outlawed in California. 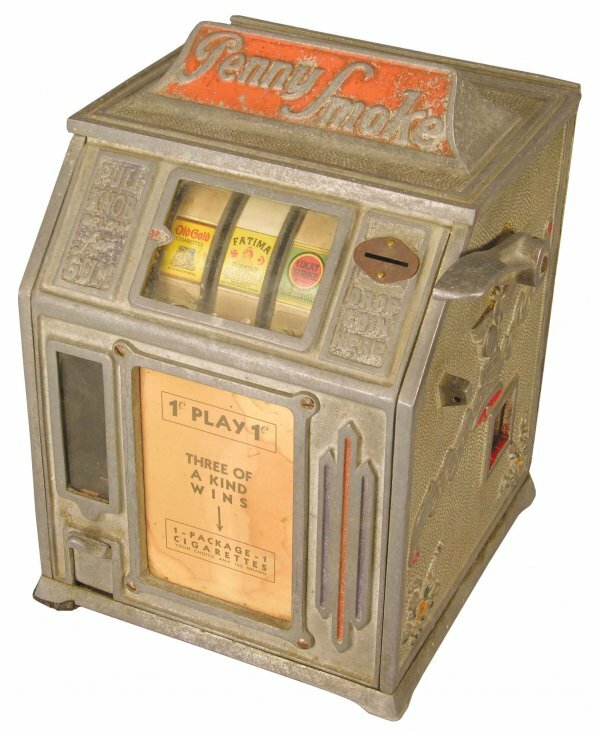 While the Liberty Bell paid out money, other machines existed that awarded prizes other than cash; Sittman and Pitt devised a poker-based game which could win the player beers, cigarettes and the like from the bar in which it was placed while the ‘trade stimulator’ was s small counter-top machine which awarded fruit-flavoured chewing gum related to the symbols. Giving out non-cash prizes was also a way to avoid getting caught out by anti-gambling legislation. The use of a single lever on one side of the machines gave them the alternative moniker of ‘One Armed Bandit’. An example of a Trade Stimulator – note the prizes on offer. In the first decade of the 20th century other companies began to get seriously involved in the industry, Herbert Mills being one of the most successful. The popularity of slot machines in the United States has of course always been linked to the arguably harsh anti-gambling legislation in many parts of the country. Bars, cafes, brothels and the like were the original settings but from the 1950s onwards as Nevada and New Jersey developed their gaming industries, slots have been integral features of bricks and mortar casinos. The first electronic devices were introduced by Bally in the early 1960s and the next decade witnessed the first video slot. By this point the single lever had been replaced by a button to press but the One-Armed Bandit name still stuck and many new games still feature the lever as a choice for players. Some of the biggest casinos now contain thousands of slot machines and there’s no evidence to suggest that the popularity of online slots is having a detrimental effect on their usage.